I like when supervillains branch out. After all, most superheroes have a good ten to fifteen main villains and then a hundred others one-shot baddies that have shown up at some point or other. 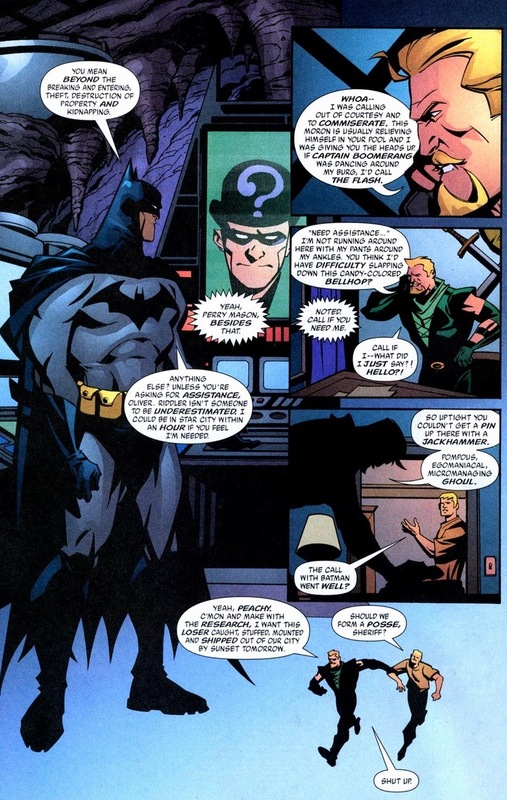 So maybe Batman’s too busy to give you that attention you so desire — after all, you’re competing against Killer Croc eating sewer orphans, Two Face holding the mayor hostage, and the Joker commandeering a blimp full of zoo animals. All at the same time. 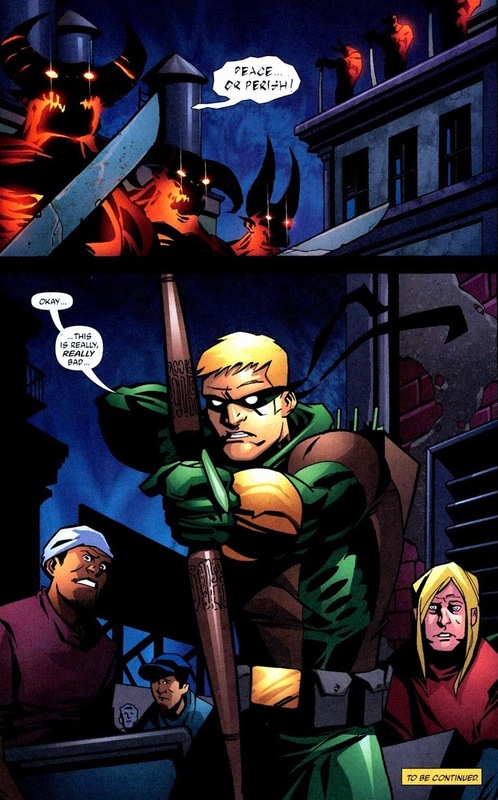 But Green Arrow? 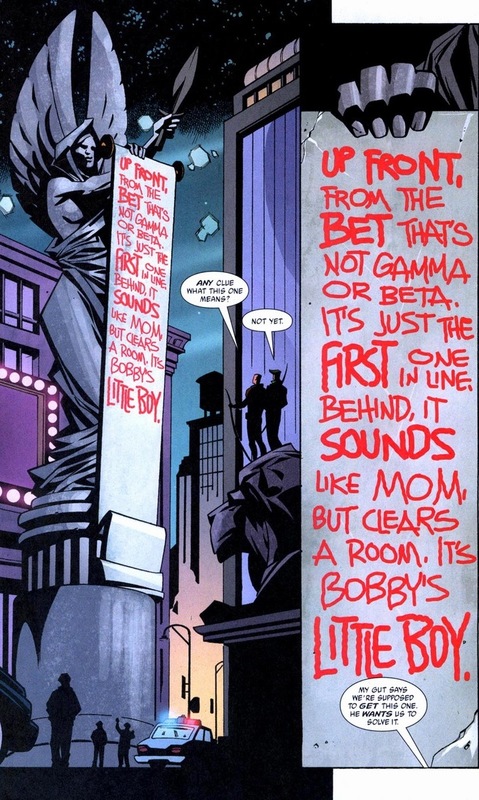 He’ll play these games — Star City has far less crime than Gotham’s never-ending explosion/murder-fest. 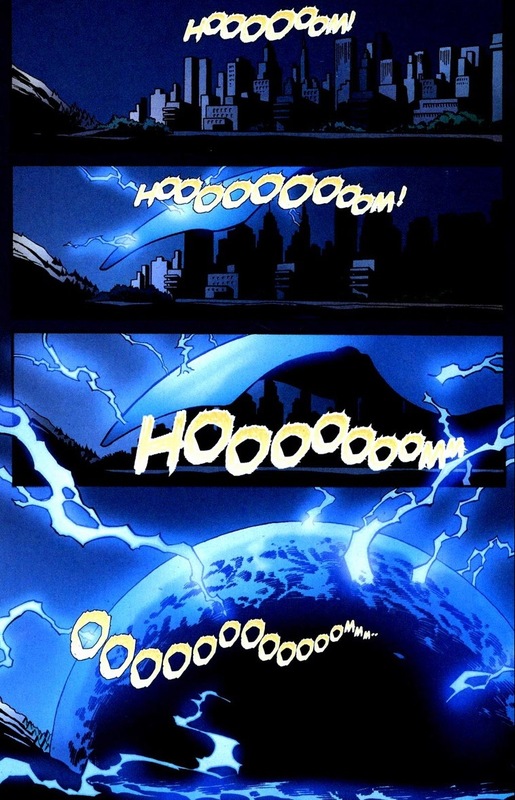 The sacred test of wits against another Justice League member that culminates in a vast superior emotional need fulfilled and satisfied. Or someone pays you a crapload of money. Either way works. 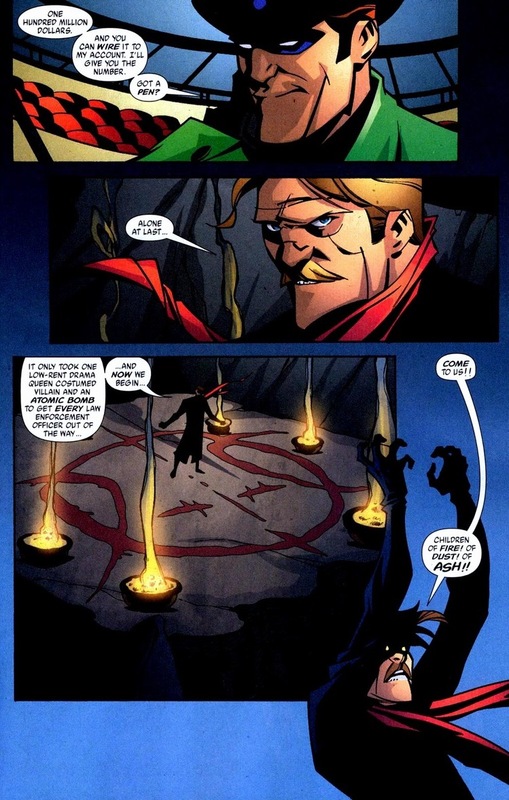 In Green Arrow #34-39, written by Judd Winick and drawn by Phil Hester, our protagonist battles one of Batman’s Arkham lineup as well as an army of fiery demons (but more on that later). I agree with Connor Hawke. 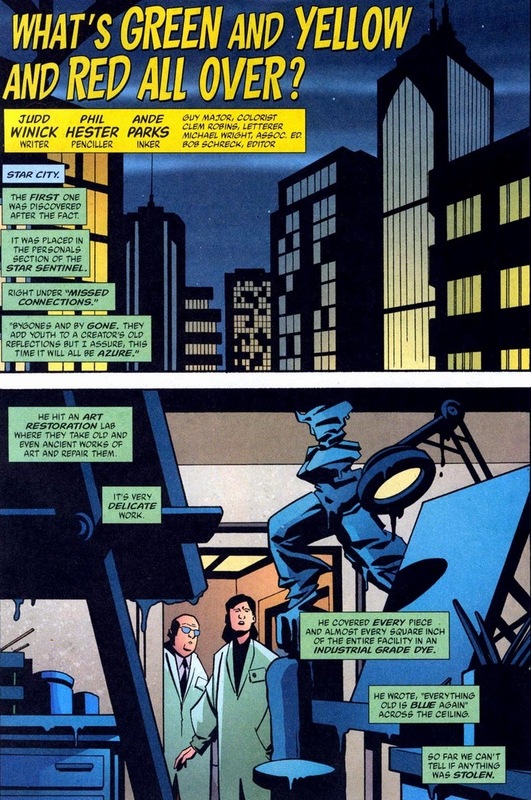 The Riddler doesn’t really possess any threat towards our Green Arrow duo, but his presence could get civilians hurt and valuable stuff stolen. Plus, you have to solve all those riddles. 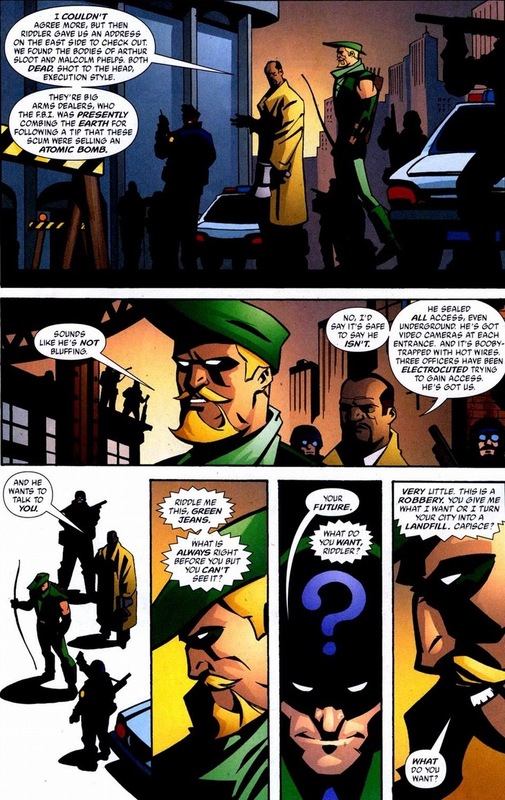 Oliver Queen’s not exactly the world’s greatest detective. Or detective for that matter. All in good fun. No one gets hurt and we have one extremely rich fig farmer. But everything leads up to something far more sinister. I mean, eventually — it takes a while. 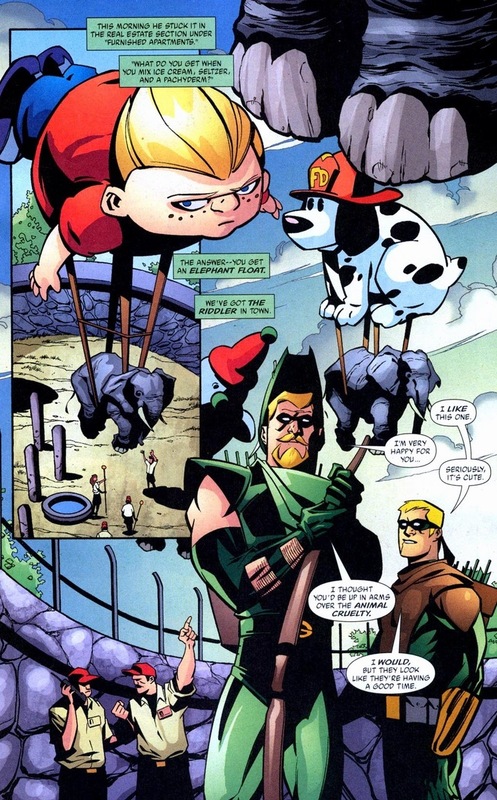 Still, with the Riddler strapping balloons to elephants, Green Arrow figures a call to Riddler’s superhero owner wouldn’t hurt. And you know those people who obviously respect but totally hate each other? You figure the non-powered superheroes would get along better. Queen’s combative by nature, sure, but shouldn’t these two bond at least over their mutual fear of firearms and grappling hook malfunctions? Superman, Wonder Woman, Martian Manhunter, Captain Marvel and the others who possess crazy powers have a wonderful time hanging out with each other — especially the first two. Oh, to be young, in love, and with the ability to move skyscrapers by hand. Y’see? He distracts law enforcement while his employers and goons steal important artifacts. Demonic artifacts. But his final plan must attract the full attention of the police. Not a single eye can turn away from the most important mission yet. What’s the best way to accomplish that? Hopefully something supervillain-y. A city covered in plums wouldn’t have the pizzazz required of a man who’s buddies with the Joker. 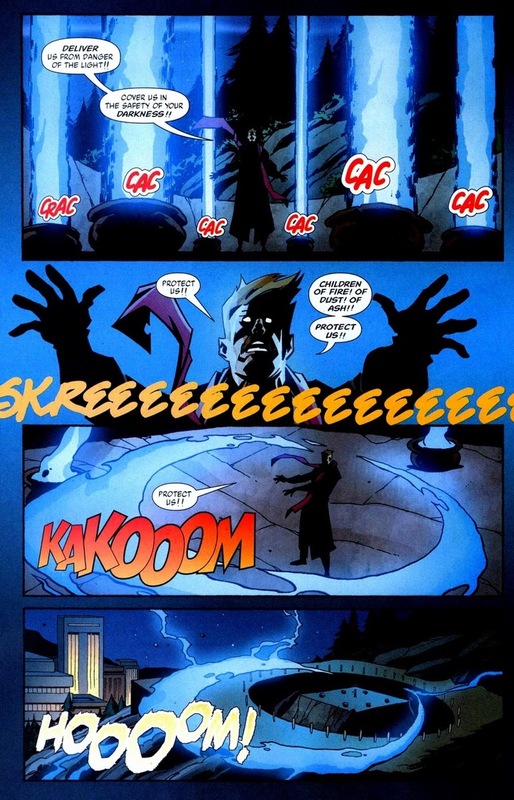 Yup, that’s the twisted supervillain we know and love. High stakes, crazy enough to detonate it, and desperate to leave a lasting legacy. A boxing glove arrow in the face won’t solve this problem. Oh yeah, remember the goal of a major distraction. This is why. Pagan rituals to summon forth ancient evils tend to bring attention. 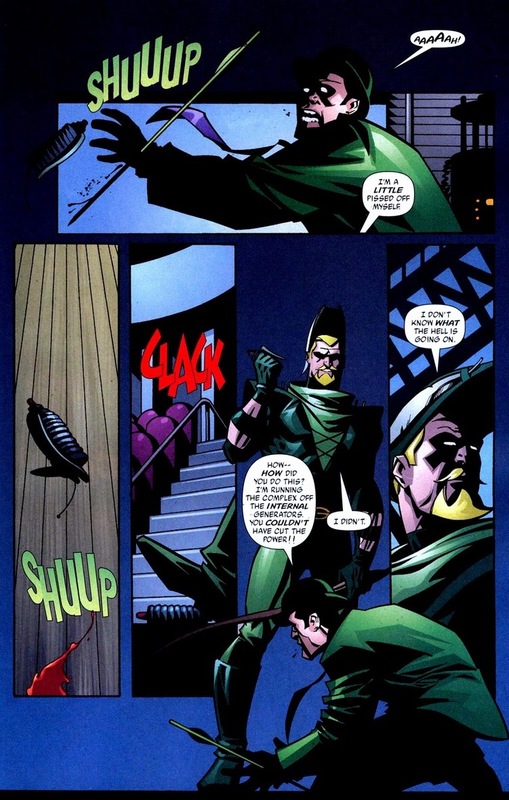 Definitely at least a boxing glove arrow in the face. 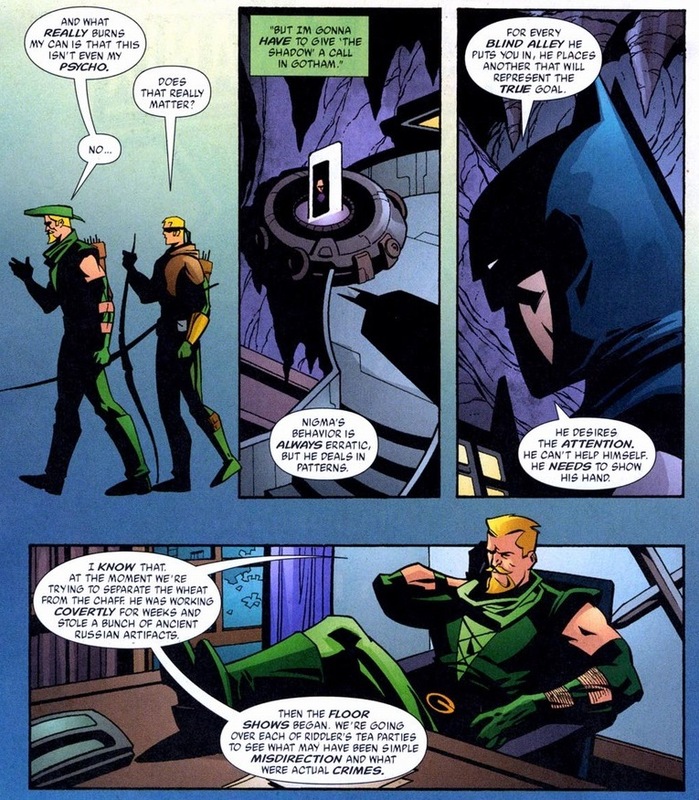 Green Arrow isn’t Batman. 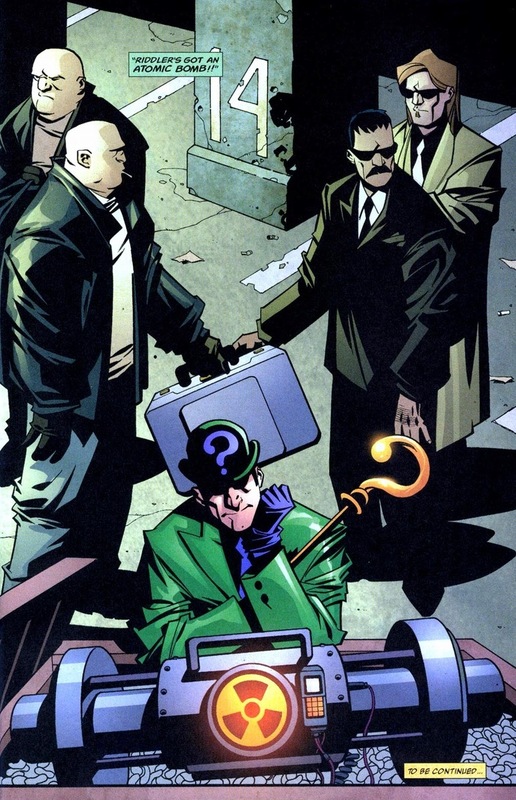 Yes, Batman would totally batarang Riddler’s hand, but it would just horribly scar, not pierce straight through. 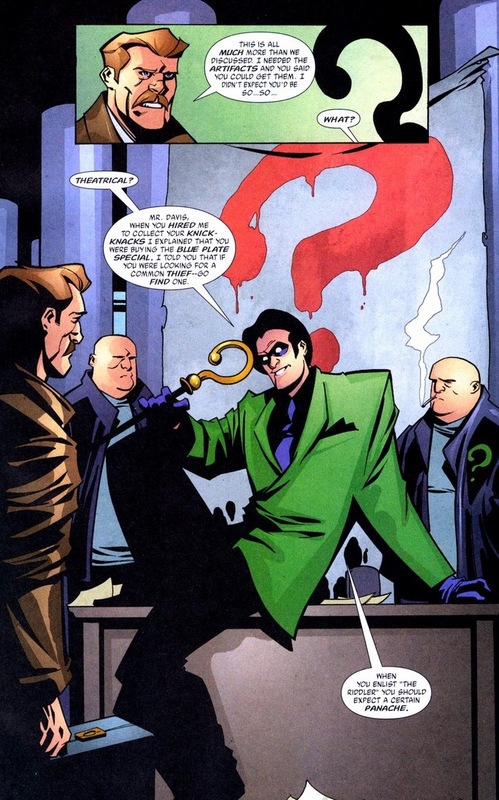 Riddler keeps forgetting that the sillier the superhero costume, the more violent the superhero compensates. Luckily, the Batman bad guy fiesta has come to an end. What’s next for our hero and his son? I agree with Hawke. 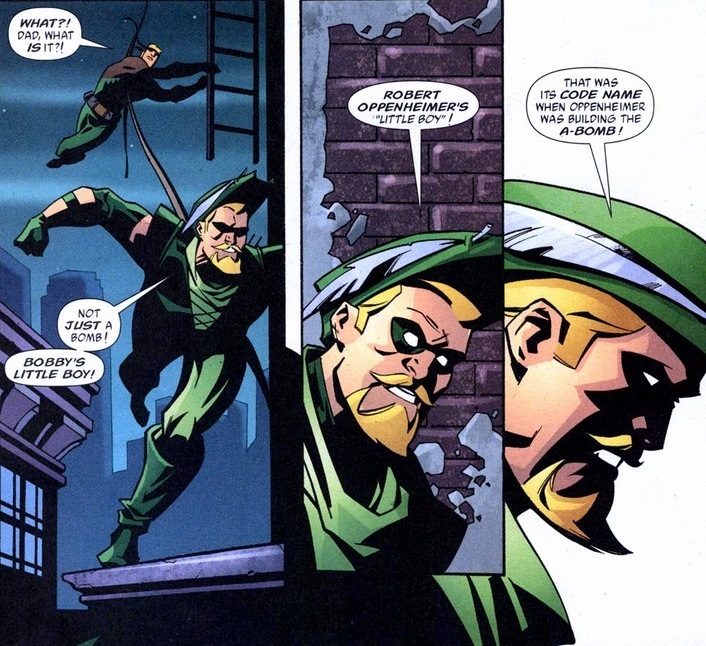 I’m scared too, but we must remember that Green Arrow shouldn’t be brushed aside. Queen has shown tremendous capability to persevere under the most stressful of situations and danger. He doesn’t buckle under pressure, he always bursts victoriously through evil, and he has the complete concentration and emotional control to handle a trapped, demon-infested city. 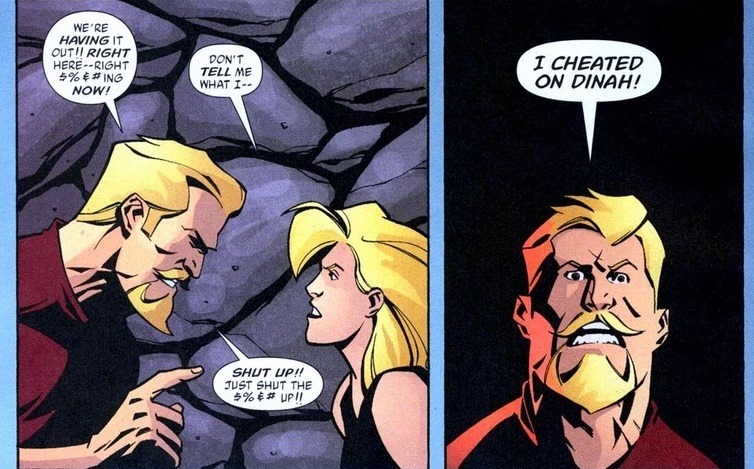 Find out Friday if he spends the next three issues writing tear-drenched poetry to Black Canary. 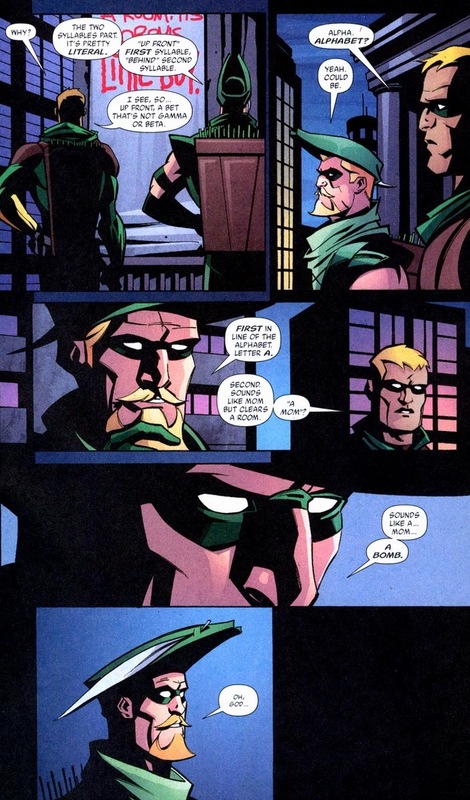 I’m really enjoying your spotlight on Green Arrow. He’s been one of my favourite characters since I read all of Mike Grell’s run in the 90’s, (definitely worth a read if you like Oliver Queen) but I never feel he gets enough respect. Phil Hester did a wicked job on this book, his style is quite cartoonish yet he manages to imbue some darkness in to it. Plus he gives Ollie a sweet mustache and beard which is crucial. I haven’t caught up with the latest run yet as I’m waiting for Lemire’s first arc to hit trade. 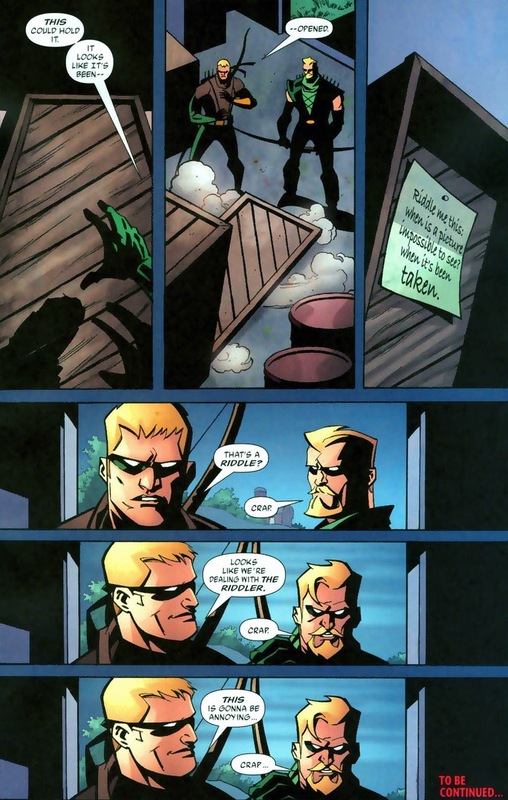 Are you reading the New52 Green Arrow? Thanks bro, I always enjoy reading. Thank you! I always fall back into my adolescent days where I had to pick one over the other: Star Wars vs. Star Trek, Green Arrow vs. Hawkeye, etc. 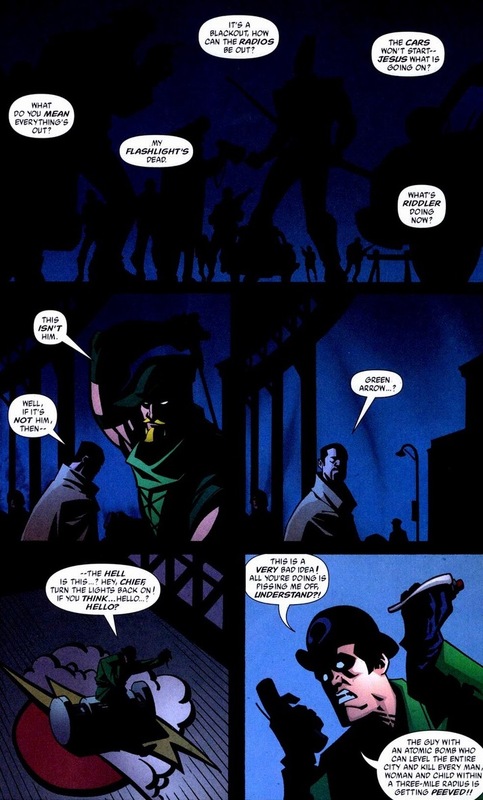 But after taking the time to read Green Arrow stuff, the books are really, really good. I definitely missed out those previous years, and plus, I’m a sucker for superheroes with facial hair. I haven’t caught up with the New 52 Green Arrow (I will be very soon though), but I did read the most recent Zero Hour issue and it was fantastic. Once again, I appreciate your support and you’re one of my favorite people!